Often, a sculpture is the centerpiece of an indoor or outdoor living space. Whether you have a contemporary motif, or something more traditional, we have a metal, concrete, or ceramic sculpture that will become a topic of conversation amongst your guests. What you won’t find at The Pottery Place Warehouse is the same boring mass-produced sculptures you see at major department stores. What you will find is an ever-changing selection of quality, handcrafted, one-of-a-kind creations made by artisans and family owned shops. We deal directly with these vendors, essentially cutting out the middle man, and then pass on the savings to you. If you like having choices, then take some time to browse our broad selection of ceramic sculptures, metal sculptures, and concrete sculptures in our 8,000 square foot facility and on our three acre piece of property. 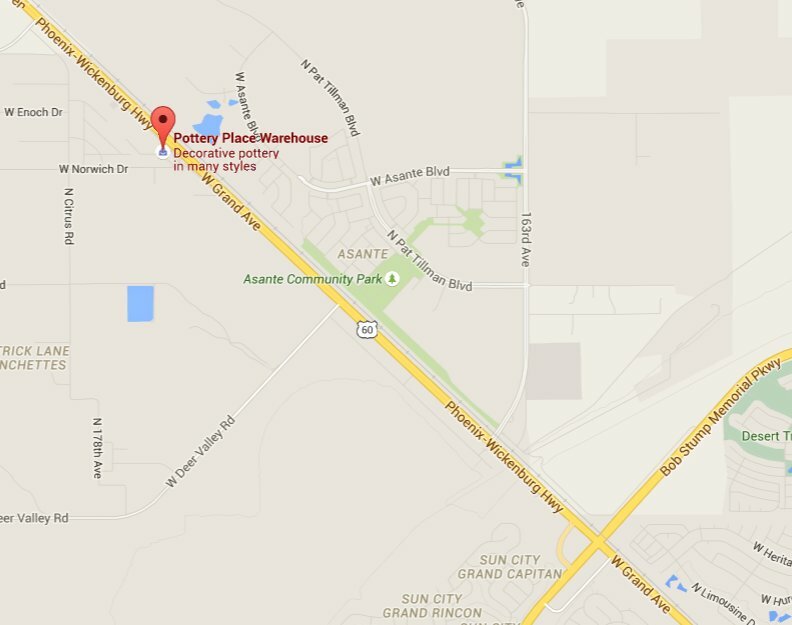 We are eager to have you at our new Phoenix, AZ location, so follow these directions to The Pottery Place Warehouse, or call (623) 214-9080 to find out if we have something specific. With so many sculptures and metal art to choose from, a visit to The Pottery Place is more like an event than shopping. Our assortment of concrete sculptures come in many sizes and styles. Most are durable pieces that are suitable for outdoor use, and can be combined with pottery, planters, and other hardscape decorations to enhance any backyard garden, poolside, or front yard. Concrete statues are popular with many homeowners, because they provide a focal point for an open space. More contemporary concrete sculptures take on abstract shapes, and may be more suited to your existing decorations. Either way, we are confident you will find exactly what you’re looking for by browsing our expansive inventory of concrete sculptures. Decorating can be difficult, especially when you’re trying to find the perfect accent to a room, but just can’t seem to find something that expresses what you’re trying to convey. Our ceramic sculptures are handmade originals – works of art, in moth modern and traditional styles. Whether you’re looking for a dining room table centerpiece or something larger for a bare corner in your living room, we have ceramic sculptures and metal art that will quickly become a topic of conversation with your guests. Many visitors to The Pottery Place Warehouse don’t know exactly what they want when they walk through the front door, but they usually know it when they see it. Our facility is made for casual browsing. Because we have such a diverse collection of merchandise, there is no way to wrap your head around it until you see it with your own eyes. Metal sculptures are becoming more and more popular with Phoenix, AZ homeowners. Some of these creations are truly magnificent, from life-size horses made from sheets of metal to otherworldly creations that seem borne from the imagination. We have metal sculptures suitable for both indoor and outdoor decor, some of which is truly mind-blowing in its originality and appearance. Metal sculptures make a statement, and can be incorporated into any interior or exterior design. Because our metal sculptures are purchased direct from the talented artists that make them, we pass along savings that make them more affordable than the cookie-cutter offerings seen in major outlets and chain department stores. As proud, longtime Phoenix business owners, we are proud to call this city our home. Our climate and lifestyle is unique, giving great freedom to explore many different styles and motifs when decorating our homes. At The Pottery Place Warehouse, our goal was to give people a never ending supply of ideas by offering the largest inventory of unique, original sculptures, pots, planters, and other handcrafted indoor and outdoor decor items. Our new location is the culmination of our hard work, and since 1998 we’ve made giving people choices our Number One priority. Come out and see our new home on Grand Avenue, stay a while, and find the perfect accent for your home or garden.